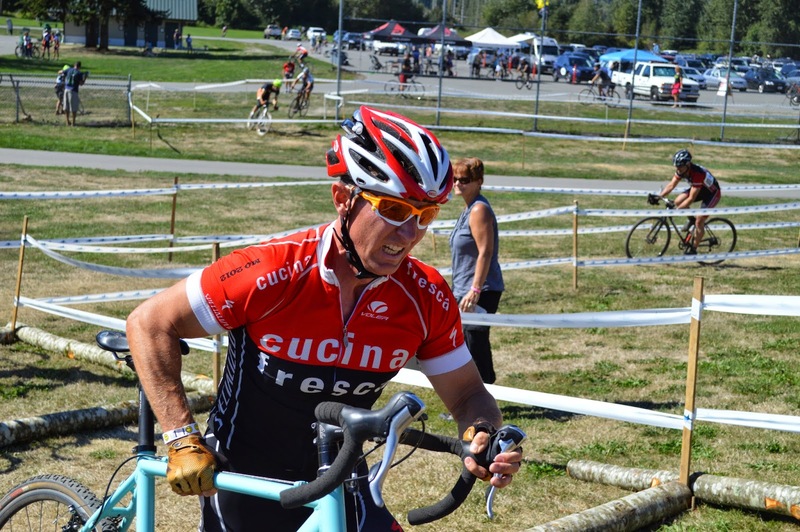 The big Cyclocross event here in the Seattle area is Starcrossed. It’s our chance to show the East Coast guys that the cross scene here in Seattle is legit. For the past few years the race has been conducted at the Marymore Park Velodrome, not exactly a great venue, but Zack and Terry do the best with what they have. This will be my final year as a self-seeded Cat 4, and I want to go out with a bang. I’d like to get on the podium at least once, and hey if you’re going to podium you might as well podium at the big race. Since I’d finished sixth place the week prior I was thankfully called up to the front row as the Masters 45+ Cat 4 race had 52 eager guys on the start line. Right out the get go I hooked a guy’s bars and either sent him into the bushes or onto the ground, I think it was the former. I didn’t get a chance to pre-ride the course and so I took the first lap a bit cautiously, but I was in the top six or seven so I couldn’t take it too easy if I wanted to hold position. Folks were complaining about the dust and ruts but honestly I found the course less dusty and with fewer ruts than in years past. By lap three I was comfortably in fifth place riding the wheel of a strong guy. I wasn’t feeling super strong, and so I decided to hang on the wheel for a while to see what might happen. On the second to last lap my accomplice and I passed the number three guy and from how it looked we had a fairly good gap on the rest of the field. One and two were out of reach, so now I just had to play it smart and find the right place to attack for third. Number three was not giving up easily. He gapped me coming out of every turn forcing me to burn coal to catch up. I figured that I might be able to take him on the final straight to the finish but I missed by one second. Just missing my first podium was a bit disappointing, but I raced well and in the end was beat by a guy who deserved it a little more.